Earns standing ovation from the Minnesota House of Representatives. SIMEK’S has been recognized by the Minnesota House of Representatives for its charitable work and impact on the community. 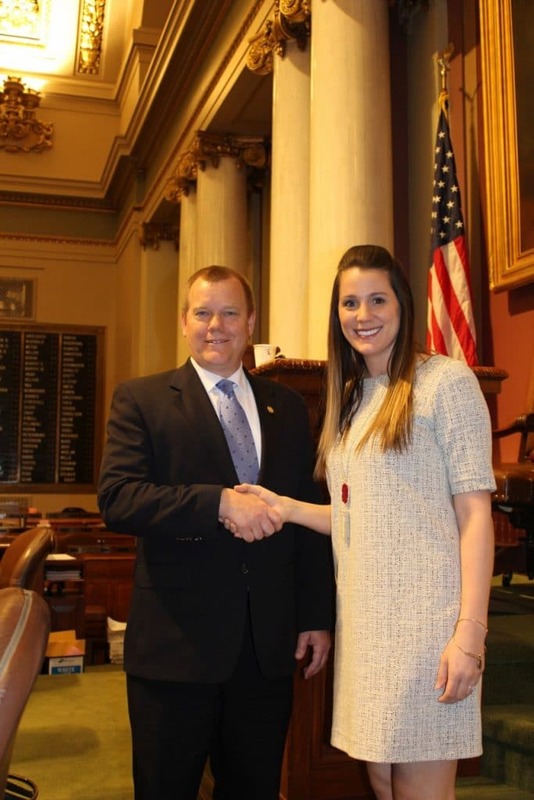 Rep. Tony Jurgens congratulates Lindsey Hickey (Bruber), president of SIMEK’S. The St. Paul Park, Minn.-based frozen food company donates 10% of profits to charity and partners with 14 nonprofit organizations to impact the world, both locally and globally. Specializing in fully cooked meatballs and all-natural lasagna, SIMEK’S also sponsors the community of Mutomo, Kenya, through donation to its schools, hospitals and children with special needs. To continue to promote a culture of giving back, SIMEK’S launched a new Volunteer Time Off program for the 2017 calendar year. This program allows all SIMEK’S team members up to one week of paid time off to volunteer for the nonprofit of their choice. This is in addition to all regularly received time off. The recognition concluded with the reading of a House Resolution thanking and commending the company for its many generous contributions. SIMEK’S received a standing ovation from the members of the Minnesota House of Representatives. SIMEK’S, which just became a member of the National Frozen & Refrigerated Foods Association, is committed to making mealtime easier while helping those in need. Through its Mealtime With A Cause™ initiative, a portion of all proceeds are donated to help feed the needy. SIMEK’S is a family-owned organization and is also certified as a woman-owned company through WBENC. Based in Saint Paul Park, Minnesota, it has been a fan-favorite food label since 1972. For more information, visit www.simeks.com.